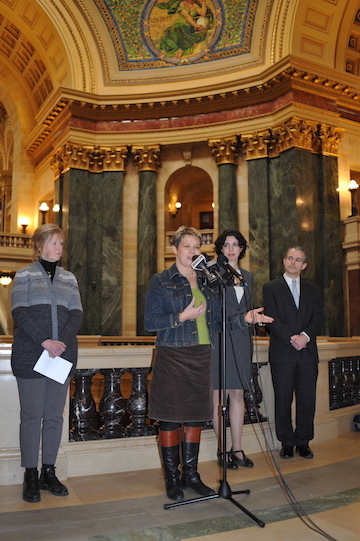 Lisa Kivirist, co-author of Homemade for Sale, speaking at the Wisconsin State Capitol at the press conference for the lawsuit, arguing that the State of Wisconsin’s cookie and baked goods ban is unconstitutional. Anyone with an oven and a recipe should be able to have a baking business from their home kitchen, at least when starting out. But that is not the case in Wisconsin, where selling baked goods made in your home kitchen is punishable by up to $1,000 in fines or six months in jail. Wisconsin is one of only two states (the other being New Jersey) to ban the sale of home-baked goods. Lisa Kivirist, co-author of Homemade for Sale and farmer at Inn Serendipity, has joined forces with two other women farmer friends to work with the Institute for Justice to bring a lawsuit against the state of Wisconsin’s Department of Agriculture over the right to sell cookies and other baked goods made in a home kitchen. 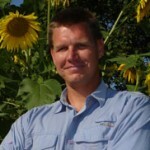 This post is a follow up to our “Lobbying for or Amending a Cottage Food Law” blog. The best, cheapest and (sometimes) quickest route to get cooking in your kitchen (legally) is through the legislative route. But getting a new law passed or expanded can take a lot of time and effort. You’ll need to build coalitions, network with other CFOs, and make bipartisan connections to support the bill when it comes to a vote. It can also be remarkably rewarding by being a participant in our democracy beyond heading to the voting booth. We went this legislative route in 2013 and our Wisconsin “cookie bill” passed the Senate. But despite bipartisan support in the Assembly, Speaker Robin Vos failed to put the cookie bill on the agenda for a vote. All the committee hearings, letters and so forth were for not. His decision to prevent the Wisconsin Assembly from having a chance to vote on the cookie bill sent us back to square one. So, another route is to pursue the third branch of government: the judiciary. You can work toward making a case in front of a judge, asking for a “court opinion” or “ruling” that might grant you the freedom to earn by striking down an unconstitutional state law preventing you from doing so. What’s great about this outcome in court, if favorable, is that unlike a law passed by a state legislature, which can be changed or repealed, a court opinion or ruling cannot (unless overturned in the appeal process, assuming there is a legal basis for the appeal). Kivirist and the other plaintiffs are challenging the constitutionality of the home-baked-goods ban as a violation of their due-process and equal-protection rights under Article I, Section 1 of the Wisconsin Constitution. All that they ask is that people in Wisconsin be able to sell safe home-baked goods, like cookies, muffins and breads, directly to consumers. The due-process right relates to being able to pursue a chosen livelihood without arbitrary, unreasonable or oppressive governmental interference. The equal-protection right relates to similarly situated individuals to be treated similarly. For example, those who wish to sell safe home-baked goods are similarly situated to those who are already selling homemade popcorn, honey, maple syrup, sorghum syrup, cider and canned goods. The Institute for Justice was previously involved with a lawsuit filed in the State of Minnesota, the first in the nation related to cottage food laws, claiming that the Department of Agriculture does not have the right to limit homemade food product sales. The case likely helped lead to the passage of a greatly expanded Minnesota cottage food law in 2015. On behalf of their cookie-baking client, the Institute for Justice won a constitutional challenge when the Minnesota Court of Appeals rebuked the state for a “lack of evidence in the record” on how the cottage food restrictions related to cookies and baked goods would protect the public. Time and time again, when states loosen their laws related to selling non-hazardous foods prepared in their citizens’ home kitchens, free enterprise wins. Mom and pop small businesses sprout up, serving their fresh baked goods or canned jams or jellies to their local community, making a more self-reliant local economy. In Texas and California, for example, over a thousand new business were created since these laws have been passed. As of December 2015, the state of Arizona has over 4,500 cottage food businesses registered. Just about every big business started small. Rather than stymie entrepreneurship, states should be encouraging it. But it may be up to aspiring cottage food operators in their state to work with their legislators, or get the ear of a judge, to make it so. How can you help the outcome in Wisconsin? Share this story as far as wide as you can. Known as the “fourth branch of government,” the media and people like yourself can play a vital role in influencing the way politics play out. Regarding the cottage food laws overall, am I able to give my food away rather than sell it? If so that reveals the real motives. The “we will force you to need us” mentality and money. Both have the same result, and that’s that they assume they own commerce, my labor related to commerce, and as a direct extension, me. Don’t get me started on property taxes. Ok I’ve vented haha….Count me in for support.